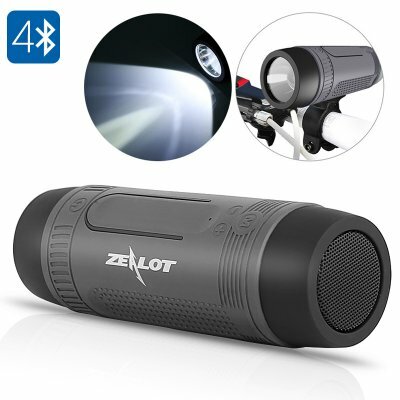 Successfully Added Bluetooth Speaker Bike Light - IP57 Waterproof, Flashlight, Bluetooth 4.0, FM Radio, 3W Speaker, 4000mAh, Handsfree Calls to your Shopping Cart. This Amazing outdoor Bluetooth speaker lets you do so much more than simply listening to your favorite tracks. It features an extremely durable and IP57 waterproof design. Therefore you’ll be able to listen to music no matter where you are. Also, it features a built-in microphone meaning you can engage in hands-free phone calls. But this is not all; your outdoor Bluetooth speaker also comes equipped with a powerful flashlight. With its clip, you'll be able to easily attach it to your bike and use it as a LED bike light. This truly makes it a multifunctional tool that can be used for many purposes. Listen to music, engage in calls, and light up the path in front of you – nothing is too much for this Bluetooth speaker. By supporting Bluetooth 4.0, it treats you to lightning fast and lag-free transfer speeds. Therefore, you’ll be able to enjoy your favorite songs without encountering any delay. Simply connect it to your tablet or smartphone, and you’ll be ready to go. Additionally, your wireless speaker also supports regular FM radio frequencies. This allows you to listen to the latest tracks and talk shows while riding your bike. Thanks to its 3.5mm Audio Jack, it lets you enjoy great audio without disturbing others around you. Within its waterproof body, this bike light speaker packs a powerful 4000mAh battery. This cell treats you to 10 hours of usage time. This makes it the perfect outdoor gadget that lets you listen to songs and light up your pathway throughout the entire day or night. Its 3W speaker brings forth audiophile-grade music quality that can be enjoyed no matter where you’re at. From now on, you’ll always be able to listen to the tracks of your liking.